Dr Andreadis is an I Quit Sugar Expert as part of Sarah Wilson’s 8 Week Programme. She coaches people to eat as healthy as possible. Why is what we eat so important in preparing for a baby? We really are what we eat. If you eat badly, your body will not have the resources needed to carry out all important roles such as cell division, and DNA replication. We are no longer thought to be victims of our genes, but rather our genes a victim of us. 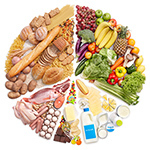 There is an emerging science called nutrigeneomics and nutrigenetics. These branches of science explain the interaction between food and our genes. What we eat, can impact on the genetic information our genes express – in other words, the information our genes give our bodies to carry out all functions. Why does Nutrition Affect Us All? Not only is good nutrition important for making you healthy, but it can also impact on the health of your children and grandchildren. We spend time discussing your diet and eating patterns. This is equally important for both female and male partners. We don’t have control of many things like our age, but we have ultimate control over what we choose to eat and drink. Often we forget to address the root of the problem, which tends to be deeply rooted in our lifestyle habits. Food is medicine. You are what you eat. Plain and simple. Sometimes we overlook this and forget how vital a good, balanced, wholesome diet and eating habits are to our health. Dr. Andreadis has a special interest in nutritional medicine and likes to keep her patients up to date with the latest in the field. She is currently a student of IIN – Integrative Nutrition..
Natasha is also interested in the environment and encourages her patients to assess their chemical exposure.